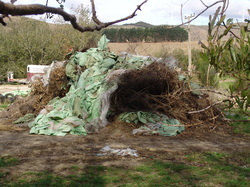 A big pile of plastic farm wrap awaits dry weather for a burn off. And it is totally recyclable! "Individuals can make a difference"
P.O.O.P. cares about people and our planet. We want to make a difference, an environmental impact, as we question over-packaging. We want to be provocative, have fun, and be a group that helps to stimulate a social conscious. POOP wants to create awareness and provide support for individuals as we challenge and educate manufacturers and distributors to reduce, reuse and recycle. In doing so, to raise our own standard of living while protecting the planet. Why not P.O.O.P with us? POOP will raise awareness to packaging issues and over - packaging. How about a bumper sticker or two?